America – that shining land of opportunity. I know I take my freedoms for granted. They’ve just always been there, and it’s hard to imagine life without them. 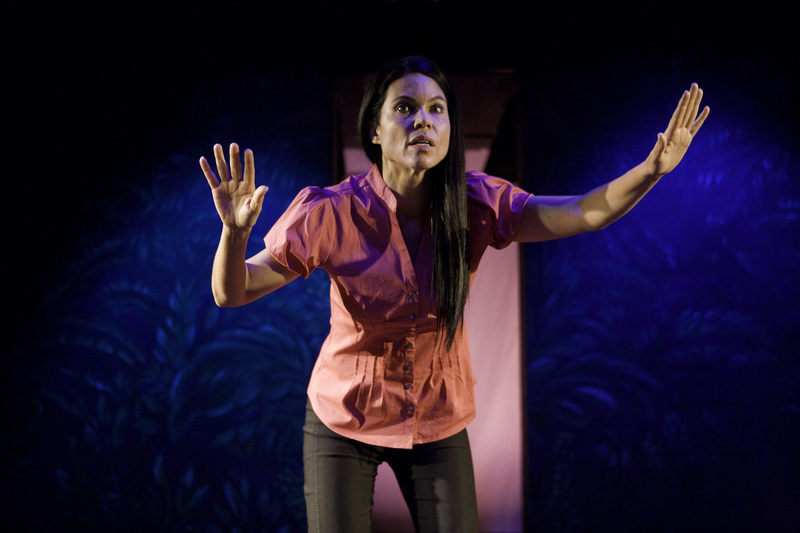 However, in Debra Ehrhardt’s semi-autobiographical one woman play, Jamaica, Farewell, she reminds us that we have it pretty damn good. And for a young girl growing up in a third world, highly volatile country who’s looking at us from the outside in, there’s no risk too great to experience such freedoms. Ehrhardt is a charming, straightforward performer who easily slips between her wide-eyed childhood self to her no-nonsense mother to her deadbeat alcoholic father, as well as other colorful characters on her path to freedom from ravaged 1970s Kingston, Jamaica. She certainly knows how to spin a tale using both humor and pathos, and the dramatic stakes get higher as, after several false starts and dead ends, she latches onto a risky and nearly life-threatening opportunity involving a bag of money and a man named “Bullet” to make it to America. I’d be interested to know how much of it is true vs. teased up for dramatic purposes, but I was engaged throughout, and it all felt honest, so that’s what really matters. That said, the play has many rough edges. Sound and music cues are thrown in like afterthoughts, and the stage features a giant, white video screen that’s only used at the very end to project the American flag. A wasted opportunity to complement her compelling story with arresting visuals of her homeland and perhaps the actual people in her story. The ending also feels jarring. Yes, she got to America, but what did she learn? A summary of “where are they now” for the characters in her story is fine, but I want to know where Debra is now — was America all she dreamed of?